Overall, the price is erratic through 45 years but it makes a significant upward trend later. The line chart illustrates the information about the values of US currency each five years from 1960 to 2005. It is clear that the price fluctuated throughout this period and reached the highest point at about 870 dollars in the end. 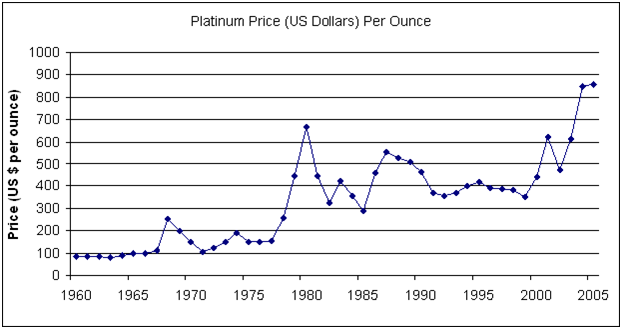 The graph shows the price of platinum per ounce in America in a fortyfive - year period from 1960 through to 2005. Nhờ anh (chị) và các bạn nào có kinh nghiệm về Ielts writing chữa giúp em bài viết với ạ, em đang tự ôn Ielts và đây là lần đầu viết bài task 1. Rất mong nhận được góp ý của mọi người ạ. Thanks all.